"The colossus who conquered the world!" 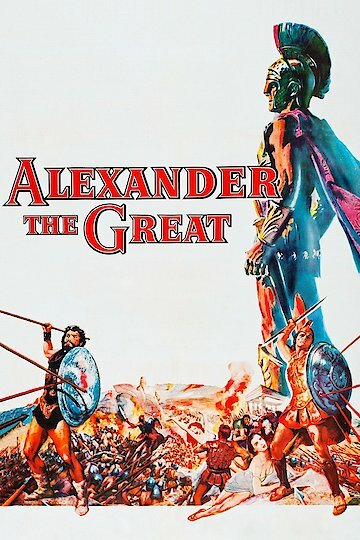 Alexander the Great is a film based upon the life of the Alexander of Macedon, who famously conquered much of the known world. The film follows Alexander’s (Richard Burton) life from his birth until his eventual conquest of the Eastern world. Alexander is taught by Aristotle during his childhood, giving him all the knowledge he’ll need to rule as king later on. Alexander’s rule over the Macedonian capital shows that he is not under the control of his father or mother, as well as his future greatness. Alexander’s father, Phillip II (Fredric March), returns from fighting in Greece and divorces Alexander’s mother, which challenges his succession to being king. Phillip II is assassinated by a friend of Alexander, which allows him to claim his father’s title and loyalties needed to retain power. Philip II’s advisor and friend Memnon (Peter Cushing) refuses to swear allegiance to the new young king and is exiled from Macedon. Alexander then begins his invasion of Asia Minor; the underestimation of the “boy king” by the Persian Darius III and failure to heed Memnon’s military advice leads to crushing defeats and the eventual capture of Babylon by Alexander and his Macedonian army. Darius III flees to rebuild his army but is killed by his own generals, who are displeased with his leadership and military competence. Alexander honors Darius III by marrying his daughter and punishing those responsible for the assassination with impalement. Alexander continues his movement eastward into India where his men, tired and homesick, start to rebel slightly against Alexander. Alexander’s paranoia reaches a climax when he murders his friend in a drunken rage over supposed plots to overthrow him. Alexander, humbled by his actions, returns to Babylon and his wife but falls severely ill soon after. He dies not long after his illness, leaving no clear successor to his vast empire. Alexander the Great is currently available to watch and stream, buy on demand at Amazon, Vudu, Google Play, iTunes, YouTube VOD online.